Asheville’s latest hot spot, Bhramari Brewhouse, takes its name from the Hindu goddess of bumble bees, and surrealist bee art by Leif Erik Johansen helps set the scene at this stimulating and welcoming new brewery, taproom, and restaurant on the city’s burgeoning South Slope. Located around the corner from The Orange Peel, the gastropub is quickly becoming a popular pre- or post-show place to eat and drink, offering ample libations, a lively taproom or quieter dining room seating options, and an inventive menu. Add live music three nights a week, a large southwest-facing patio, and adjacent parking lot (a rare convenience in downtown these days), and Bhramari is as sweet as it sounds. In the airy taproom, where a stunning wall of horizontal cross-cuts of sycamore stumps acts as a counterpoint to gleaming stainless-steel vats and an industrial wall of 27 taps, Bhramari serves suds from several local breweries and is also developing its own brews. Five have debuted so far, including the Good Flight, a soft and citrusy elixir with honey undertones, and the Carolina Common, which has notes of caramel and sweet corn. There’s also an infused version of the Carolina Common that changes daily. The additions could be bacon and cacao nibs one week, pineapple and jalapeño another, suggests Josh Bailey, one of the three owners. 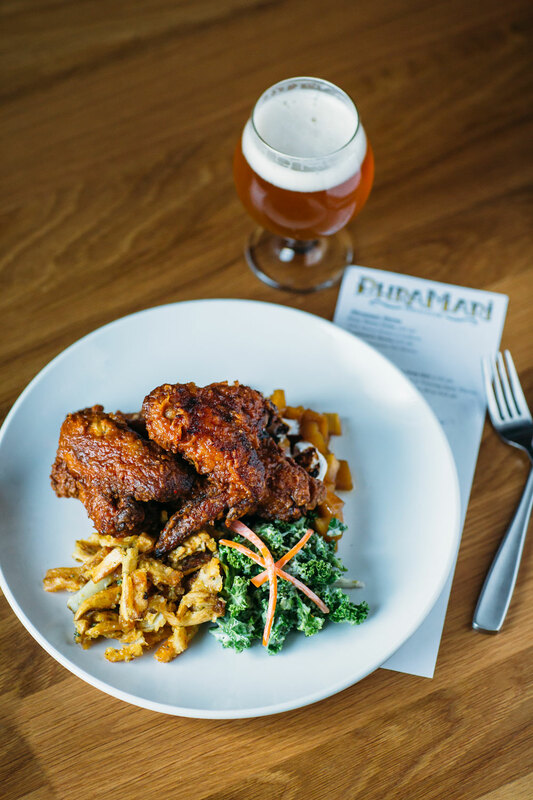 Bhramari is the brainchild of Bailey, a mixologist and cofounder of Eating Asheville food tours and Asheville Brewery Tours; Josh Dillard, a Chicago Le Cordon Blue graduate and veteran of Zambra; and Gary Sernack, a longtime homebrewer with culinary chops from Johnson and Whales in Denver. In addition to an evolving menu that experiments heavily with pickled items and sweet and sour notes, and offers small, medium, and large dishes for a variety of appetites, the use of spent grains here is highly unique. Dillard and Chef de Cuisine Jake Whitman consistently experiment for over-the-top culinary combinations, quite often utilizing the beer-production by-products. Dillard dries and grinds the malt and other grains left over from the brewing process on-site. These go into making items like the spent-grain pretzel, served with house mustard, jalapeño cheese sauce, and black patent and honey; noodles; and the delicate little “saltine” crackers that accompany the pickled egg plate. It’s the small touches like these tiny buttery crackers that elevate a brewpub snack to a dining sensation. The plate itself is a work of art, with dabs of aioli, orange marmalade, and hot sauce. During a recent visit, a cured sardines dish showcased some world-class preserving activity and made for a beautiful plate. The pungent fish paired nicely with a touch of goat cheese, a slice of pickle, crostini toasted just so, and a 64-degree yolk. Sweetbread-studded sausage demonstrated the kitchen’s finesse with charcuterie. The sausage bites (served on an unusual black-grilled slice of naan) proved to be typically creamy and rich, all nicely counterbalanced with red cabbage, pickled Brussels sprouts, cooling raita, and mustard. Hints of French colliding with Indian made for fascinating table conversation as we tried to pinpoint flavors and influences. The dense fennel and apple soup satisfied with a velvety texture and acidic notes of sour apple melding with sweet caramelized fennel and toasty cashews. Stacks on stacks—tater tots mashed into patties, sautéed, and stacked like fried green tomatoes, surrounded by lashings of smooth butternut purée, earthy wild mushrooms, and warm gooey Brie—was a perfect comfort dish. A working relationship with several local and regional farms allows Dillard to take the spent grains farther afield. Morgan Farms feeds their cattle Bhramari’s spent grains, which comes back to the kitchen in the form of beef products, including one of Asheville’s best new burgers. The tender spent grain-fed beef gets a liberal glaze of stout wort (the liquid extracted from the mashing process before fermentation) that gives the patty a sweet tang, along with candied bacon. But all is well-foiled by pickles, crispy onions, and a wonderfully unctuous hop-smoked black truffle American cheese. With offerings like these and a dedication to building a community vibe, the Bhramari team has created a distinctive and happy addition to Asheville’s South Slope scene.